In the ninth pAsuram, parAnguSa nAyaki explains how the beauty of his divine hair which is beyond this world, is tormenting her. Subsequently, parAnguSa nAyaki explains how the matchless, divine hair of krishNa who has an amazing form, is tormenting her. Ninth pAsuram. parAnguSa nAyaki is explaining how the beauty of his divine hair is tormenting her saying “It is for this purpose [to torment her] that we are decorated with flowers and fragrant substances”. nUl thazhaikol – is it a bunch of thread? Is krishNa’s hair a bunch of beautiful thread, which is having prideful darkness to contain the whole world, which is reformed and is a dense, internal collection of such darkness kept with dark complexion? it is not like that. The divine hair of krishNa who is having an amazing form, which is having blossomed flowers and having fresh thuLasi, which is spreading its fragrance, has come to steal my heart; you don’t know the means by which it does this; being my mothers, you are ordering me. koLginRa … – Starting to give an example for his divine hair, and since the example does not match his hair, the example is getting decorated [to make it a match]. The darkness which consumed everything and pervaded everything, during praLayam (deluge) where there is no difference between day and night; kOL means pride, implying prideful darkness. sugirdhal means reforming it. After extracting the reformed, dense portion, and eliminating the extraneous aspect (the internal diamond-like strong dark pigment is extracted) – is this such a bunch of dark coloured thread? anRu mAyan kuzhal – She saw his beautiful hair in her heart. Only after decorating the example, it can be compared. Still, she is saying that it is the divine hair of krishNa who has an amazing form. Will these extraneous decorations bring any comparability to his naturally divine hair? viLginRa … – The fragrance from the blossoming, fresh and cool thuLasi is appearing to hit her face. 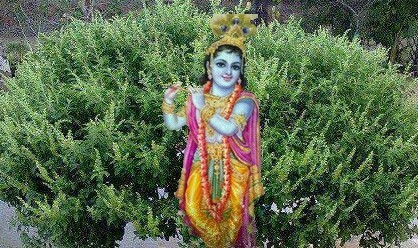 For the beauty of his divine hair, the fragrance of the thuLasi becomes the army and is causing harm. en uyiraik kaLginRavARu aRiyIr – kaLginRa – stealing. While you all remain happy, you will not know how it is specifically coming to me and stealing my soul. What does it mean by stealing? Taking it away without the acceptance of the soul. It is emperumAn who is stealing. The roles have reversed [i.e. usually, AthmA claims ownership of self, which is considered as stealing of emperumAn’s property]. One can stop if an inapt person steals, but if emperumAn who is apt [to have our soul] steals, there is no stopping. Once he gets a hold of the soul, he will then start talking with authentic texts to justify his act. annaimIr kazhaRA niRRirE – You, being angry, are scolding me thinking that I am assisting in his theft. [Instead] Can you help me by stopping this uruveLippAdu (visualisation)? Does being my mother where you can control me, give you rights to scold me? kazhaRal – hurting by words. This entry was posted in thiruvAimozhi, thiruvAimozhi 7th centum on October 15, 2018 by Sarathy Thothathri.